I've had this game under development for almost a year now, so I guess it's about time I started a topic about it here. 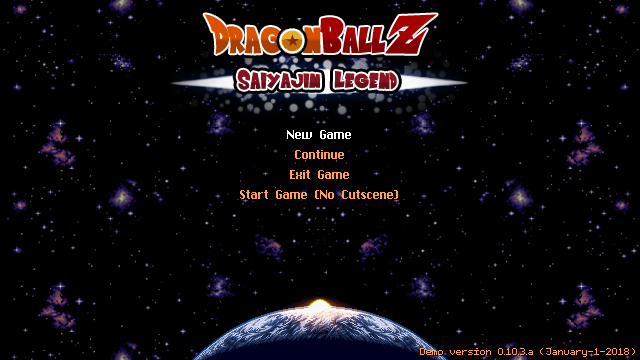 DragonBall Z: Saiyajin Legend is an action-RPG, based on the first major arc of the DBZ anime, starting with the Raditz saga and ending with Frieza's. 5 Years after our hero, Goku, has defeated his nemesis Piccolo at the World Martial Arts Tournament, it is a time of peace on planet earth. 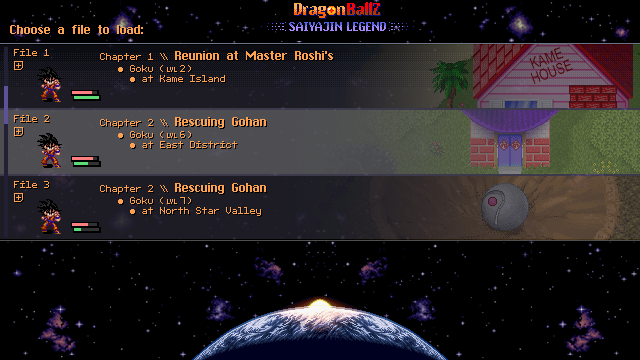 Goku is on his way to a reunion with his friends at Master Roshi's house, when a mysterious and powerful being from outer space lands on Earth and begins searching for a person he calls Kakarot. Meanwhile, deep in outer space, an elite and ruthless fighter called Vegeta is on a mission to conquer a planet with his loyal companion, Nappa. Follow the journey of Goku and Vegeta in the original Dragonball Z Series, throughout the Raditz saga and onto the end of the Frieza saga. You will experience all of their major events from the series, and a bunch of fun side-quests in-between. 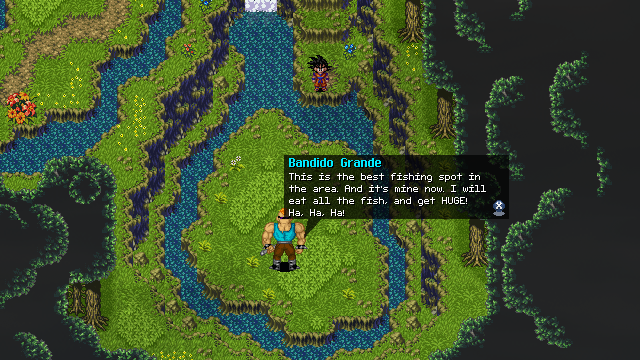 The story takes place in several locations, but two of them are major: Planet Earth and Planet Namek. In both of those planets the game will feature an open-world map with several locations to visit. 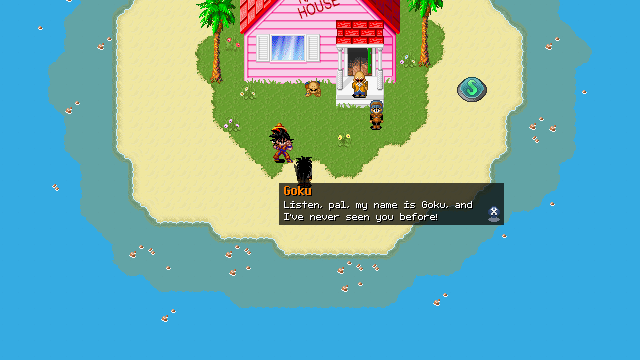 You get to play as the two main protagonists of the Z series: Goku and Vegeta. A map based, active battle system, inspired by The Legacy of Goku Gameboy Advance games, and old school DBZ fighting games. Various action-moves to make your playing experience more fun: jump, dash, teleport, sprint, etc. A custom menu system with all the necessities. A power progression system with stat points to increase your character's strength, stamina or speed by your choice, and skill points to improve your special abilities. Z-Cards - sort of a secondary talent system for your character - aquire special cards, learn them, and improve specific skills and battle abilities. 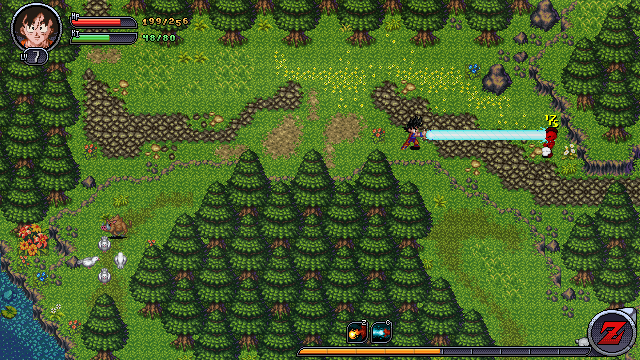 All the basic functions of an RPG: a dialogue system, save system, questing system, items system and more! Custom/Edited sprites by pixel artist George_LN, with high attention to details and smooth animations. This is the main selling point of the game and the main focus I had when I planned it. My goal is to create a fun, high-paced, flowing battle experience, that will make you want to grind before a tough boss-fight, and then enjoy that boss-fight's challenge. This is easier said than done, and requires a lot of testing and creative thinking (considering my relatively limited scripting knowledge), so we are still not there yet 100%, but with many special abilities, character and enemy stats and battle mechanics that give it some extra depth, it's going in the right direction. 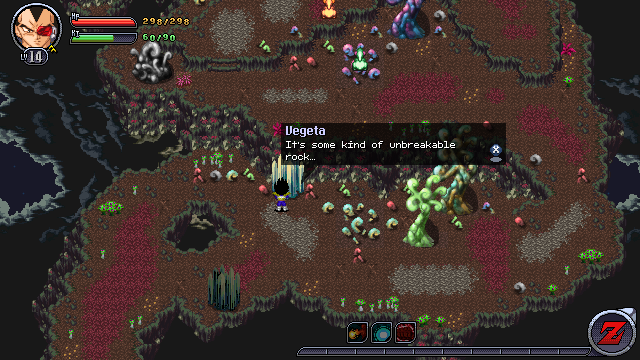 It does lack a bit in the enemy AI department at the moment, but I'm sure I can handle this too eventually. Melee/Normal Attack: Press a button to punch/kick your enemy in melee combat. Each char has 3 different random melee animations. Defend: You can block melee attacks by holding down a key, and deflect ranged skills by punching their projectile in the right moment. Special Skills: Use iconic DBZ moves, from the simple Ki Blast to Goku's powerful Kamehameha and Vegeta's Big Bang Attack. Each char will get a number of these abilities to use (undecided yet, but around 5-6). Enemy AI: Beside chasing and fighting you, some enemies can also use special melee and ranged attacks. The goal is to have most of the "regular" map enemies be pretty basic and grind-able, with some interesting skills to spice them up, and then give the bosses some more complex and special abilities. Friend AI: A person that fights besides you and helps you. I actually haven't even used that yet, but I have that functionality in the game from my old battle system and I will probably utilize it in some fights. Z-Cards: Improve and customize your battle abilities using these. More on Z-Cards down below. Several more features are planned, like a beam-struggle system, a combo system to replace the traditional energy/Ki system and more. Stats, from which you can increase your main combat stats by spending your levelup-earned stat points, and view your current character's status with some depth. Skills: Get info on your current character's skills, upgrade them with your skill-points and setup hotkeys for them. Z-Cards: Learn, remove, replace and find out about new unacquired Z-Cards. Items: Beside using the items you acquire, you can choose to hold a specific item/item-stack, to then be able to use it from anywhere on the game's open map by pressing a hotkey. Objectives: get info on your current missions and quests, their rewards and their story. Settings: Several game options like music/se volume, health-bar displays and more. PLANNED - Hotkeys: Change the hotkeys for every action in the game. Not yet implemented (because of laziness); Right now you can only change skill hotkeys. 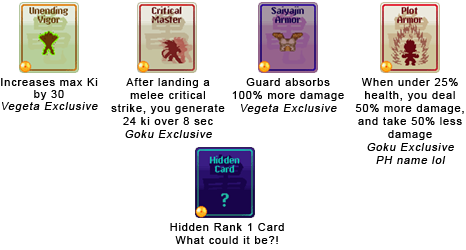 Special cards that you acquire throughout the game by questing and exploring. Z-Cards have specific ability changes that are meant to either make you more powerful, or just alter your gameplay a bit. They change all kind of battle mechanics, from adding features to your special skills to just spicing up your melee combat. Z-Cards are characters specific and are also meant to create a different feel of gameplay between Goku and Vegeta. They each have a rank, going from rank 1 for the simplest/weakest cards to rank 7 for the most unique and powerful ones. The rank is indicated by a dragonball in the bottom corner of the card. You acquire Z-Cards through questing and exploration. Most of the cards are hidden at start, but once you discover them through leveling and completing quests, you will get hints on how to get them. After you get cards, you can learn them from your Z-Cards menu. Some cards will be exclusive with one another, meaning you cant have both active at a time, some will have a permanent effect, and some will only have a temporary effect with a cooldown / you will be able to acquire them again (undecided yet). Right now most of the game engine is ready but as you know, it's hard to resist keep adding features and improving stuff all the time, and of course I also keep finding bugs to fix, systems to rewrite, etc. I really do want to release this some day so I'm trying to take a realistic approach and leave some stuff not 100% perfect like I want them, while making progress on the actual gameplay/story/mapping elements of the game. This is very hard. Right now the game has actual gameplay up to the Raditz fight, including some nice side-quest along the way and some hidden items to acquire. That's about 30-35 minutes of gameplay, maybe a bit more if you want to grind and make things easier. That means there's not a lot of actual game right now, but with the help of Link_2112 (main tester and great-idea/planning guy) and George_LN (awesome pixel artist), we are slowly getting there. There was a demo planned earlier in development but I scrapped that idea for now. This is the rank 2 Kamehameha, actually. The first one is a bit smaller and weaker. So I didn't touch Sphere at all for 8 years because real life happened, and then one day when I was looking through some stuff in my old PC, I found this old project that I loved so much. I had an urge to take it and do something with it, but I didn't want to continue my old game. 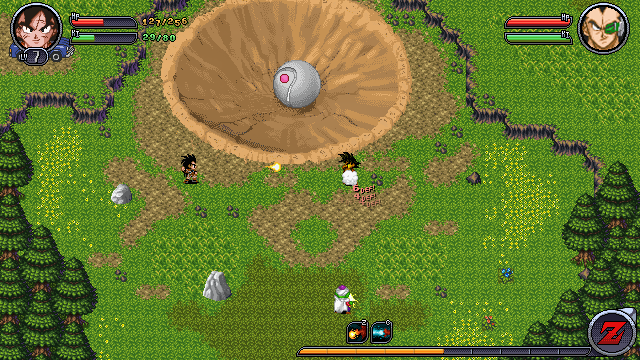 Then, I thought what could have a potential for a kickass active battle system, and naturally DragonBall came to mind! It started out as just a battle system, but then my love for Sphere and game-making, and DBZ, was reignited and I decided to try and make an actual full game, which meant having to create a lot of extra systems, and a lot more fun. 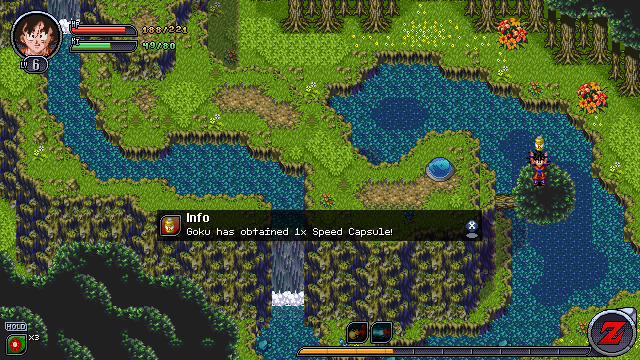 For the gameplay I'm picturing something like Secret of Mana but with DBZ characters. Would that be accurate? I played a bit of Buu's Fury a few years ago but didn't get very far in it, so I'm trying to get a feel for the battle system. In any case this looks awesome. I've seen some of this on rpgmaker.net before and I gotta say... this looks impressive and excellent, and I can't wait to see a release. And I say this as someone who's not even into DBZ. Nice work! Pretty much, yes! Lots of jumping around and hitting stuff. For the battle system I want to have some DBZ fighting game feel, with a lot of energy attacks, powerups and teleports. I just noticed the low-health powerup ability is called "Plot Armor". That's hilarious and awesome.